Formerly, the word rheumatism (Latin rheumatismus, for “flow of moods”) was used rather to designate all these affections. This term is now considered obsolete. Nearly 1 in 6 Canadians aged 12 and over suffer from some form of arthritis, according to Statistics Canada. According to another source (The Arthritis Society), 4.6 million Canadians would suffer from arthritis, including 1 million inflammatory arthritis. In France, 17% of the population suffers from osteoarthritis. Note . 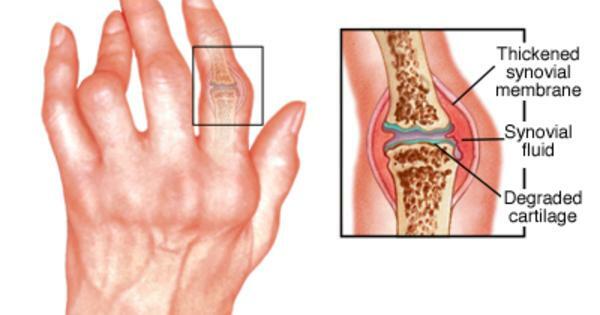 Some forms of arthritis are characterized by the presence of inflammation , but not all. Inflammation is a natural reaction of the body to an irritated or infected tissue. It causes swelling, pain and redness in the area of ​​the affected body. The arthritis can appear as a result of injury, infection or simple wear and tear, but can also be the result of a disease autoimmune in which the body attacks its own tissues. Sometimes there is no reason to explain the symptoms. The osteoarthritis is the most common arthritis; it is said that it is formed “to wear”. It is degenerative arthritis. The cartilage wear-out destruction that covers and protects the bones of the joint and the appearance of small bony outgrowths characterize this disease. It affects especially the joints that support a large part of the body weight, such as those of the hips, knees, feet and spine. Osteoarthritis is often related to age, or caused by being overweight or by the repeated use of a joint in the practice of a sport. It rarely appears before midlife. The rheumatoid arthritis is an inflammatory disease. The joints of the hands, wrists and feet are often the first to be affected. Other organs can be affected because inflammation affects the whole body. This type of arthritis usually occurs around 40 to 60 years of age, but can occur early in adulthood. Rheumatoid arthritis is 2 to 3 times more common in womenthan in men. Although the scientists have not yet discovered its cause, it seems to be of autoimmune origin and influenced by heredity. Gout and pseudogout: Deposition of crystals in the joints, in the form of uric acid in case of gout or calcium phosphate in the case of pseudogout, causes inflammation and pain, often in the big toe in the first place. In all inflammatory arthritis, connective tissue is affected by inflammation. Connective tissues serve as support and protection for organs. They are found in the skin, arteries, and tendons, around organs or at the junction between two different tissues. For example, the synovial membrane, which lines the cavities of the joints, is a connective tissue. Lupus. It is considered a form of arthritis since it is part of chronic autoimmune diseases. It is a connective tissue disease that can cause, in its most widespread and severe form, inflammation of the skin, muscles, joints, heart, lungs, kidneys, blood vessels and of the nervous system. Scleroderma. A chronic autoimmune disease characterized by hardening of the skin and connective tissue damage. It can affect the joints and cause the typical symptoms of inflammatory type arthritis. Systemic scleroderma can reach the internal organs, such as the heart, lungs, kidneys and digestive system. Ankylosing spondylitis. Chronic inflammation of the vertebrae joints of the back that develops gradually and causes stiffness and pain in the back, torso and hips. Sjögren’s Syndrome. A serious autoimmune disease that first affects the glands and mucous membranes of the eyes and mouth, causing a dryness of these organs by reducing the production of tears and saliva. In its primary form, it reaches only these glands. In its secondary form, it can be associated with other autoimmune diseases, such as rheumatoid arthritis and lupus. Polymyosite. A rare disease that causes inflammation in the muscles, which then lose their strength. Other diseases are related to and sometimes associated with various forms of arthritis, such as plantar fasciitis, fibromyalgia, Lyme disease, Paget’s disease of bone, Raynaud’s disease and canal syndrome. Carpal . Most arthritic diseases are chronic. Some will cause the deterioration of joint structures. In fact, the stiffness reduces the mobility of the joint and the surrounding muscles atrophy, which accelerates the progression of the disease. Over time, the cartilage crumbles, the bone wears out and the joint can become deformed. The different forms of arthritis have their own symptoms and their own evolution that vary considerably, depending on the individual. For example, osteoarthritis most often occurs with pain and stiffness in a single joint. As for rheumatoid arthritis, it is often accompanied by swelling and redness with multiple joints. It should be noted that joint and musculoskeletal pain is common to all types of arthritis. Risk factors vary by type of arthritis. Consult each of our cards in the Arthritis Special Section. There are several ways to reduce the risk of degenerative arthritis, such as osteoarthritis. The most effective way is definitely maintaining a healthy weight. For other means, see our Osteoarthritis report. However, with respect to inflammatory arthritis, very little is known about prevention. Many people with arthritis, regardless of the type of arthritis, manage to reduce their pain by modifying their lifestyle and using various health practitioners (physiotherapists or kinesiologists, occupational therapists, massage therapists, etc.). Arthritis pain is experienced differently from person to person. Its intensity depends largely on the severity and extent of the disease. Sometimes the pain fades temporarily. Daily activities often need to be reorganized accordingly. We do not yet understand all the biological mechanisms involved in the genesis of arthritis pain. All the same, it seems that the depletion of oxygen tissues plays a leading role. This lack of oxygen is itself caused by inflammation in the joints and tensions in the muscles. That’s why anything that helps relax muscles or promotes blood circulation in the joints relieves pain. In addition, fatigue, anxiety, stress and depression increase the perception of pain. Here are various ways to alleviate pain and stiffness, at least temporarily. The first weapon against arthritis pain is rest, especially for people who experience stress, anxiety and nervous fatigue. Of breathing exercises, mental techniques of relaxation and meditation are ways to help the body achieve relaxation. (For more information on this topic, see our report Stress and Anxiety). It is recommended to enjoy at least 8 to 10 hours of sleep to minimize pain. People with arthritis should exercise to maintain joint mobility and maintain muscle mass. Exercise also has an analgesic effect since it causes the release of endorphins in the body. However, it is important to aim for a balance between rest and activity by “listening” to your body. Fatigue and pain are good indicators. When they show up, it’s better to take the time to relax. On the other hand, too much rest can cause stiffness in the joints and muscles. The objective to achieve is a certain balance between periods of activity and relaxation, which will be specific to each. Several exercises are possible; we must choose those that suit us, by going gradually. It is better to have the services of a physiotherapist (kinesiologist) or an occupational therapist in situations where some tasks are difficult to perform. The movements must be regular, flexible and slow. Practiced in hot water, the exercises cause less stress on the joints. See also the Game of Tastes and Needs in the Fitness Sheet. It is suggested to combine different types of exercises to enjoy the benefits of each. Bodybuilding exercises are used to maintain or develop the musculature, necessary to support the affected joints. The Arthritis Society, a non-profit organization dedicated to the well-being of people living with arthritis, offers a variety of body awareness exercises (such as tai chi and yoga) to improve balance, posture and breathing. Beware of excesses! If pain persists more than 1 hour after exercise, it is best to talk to your physiotherapist and reduce the intensity of your efforts. Also, unusual tiredness, joint swelling or loss of flexibility are signs that the exercises are unsuitable and need to be changed. Heat Therapy The application of heat or cold to aching joints can provide short-term relief, regardless of the form of arthritis. – Hot. The application of heat should be done when the muscles are sore and tense. The heat provides a relaxing effect, but especially a better circulation of blood in the joints (which relieves pain). You can take a shower or a bath for fifteen minutes in hot water or apply heat bags or hot water bottle on sore areas. – Cold. Cold can be useful in times of acute inflammation, when a joint is swollen and painful. An ice pack with a thin, wet towel applied locally for 15 to 20 minutes has a numbing effect and calms the pain. It is suggested, however, not to apply cold to an already numb joint. Contraindication. Thermotherapy is contraindicated in the presence of circulatory disorders, including those caused by diabetes with circulatory complications and Raynaud’s disease. The massages relax the muscles and relax the whole body, relieving pain and cramps. It is important to talk to the massage therapist about his condition so he can adapt his practice accordingly. You can also combine the massage with thermotherapy, for example by taking a bath of hot water in a jet bath. Gentle Swedish massage, Californian massage, Esalen massage and the Trager approach are less vigorous and are therefore better suited for people with arthritis . People who are overweight and suffer from arthritis would benefit from losing the extra pounds. Even a modest weight loss is beneficial to ease the pain. This measure becomes particularly important in osteoarthritis, since overweight is a major risk factor, but also for other forms of arthritis. To calculate your body mass index or BMI (which determines healthy weight by height), do our test what is your body mass index? . Joining a social support network can help cope with the pain and physical strain of arthritis. Exchange concerns about illness, break isolation, learn about new treatments and avenues explored by medical research, sharing effective “recipes” for living better with arthritis, or even getting involved in a self-help organization are all opportunities available to everyone. In addition to self-help groups, the Arthritis Society offers a “personal arthritis initiative”: 6 2-hour training sessions delivered by trained volunteers to learn how to better manage pain, prevent fatigue, etc. The Arthritis Society also offers another program, a unique 2-hour workshop on the management of chronic pain. See the Sites of Interest section. There is no definitive cure for overcoming the ‘ arthritis. In general, medications help reduce the symptoms of inflammation, such as pain and swelling, or act directly at the source of inflammatory processes to slow the progression of the disease. If the medications are no longer effective and the loss of function of a joint is important, the doctor may suggest surgery for reconstruction or replacement of the joint.